Whenever I take the train in and out of Chicago, I’m reminded about how much better things would be if there was greater adoption of the Semantic Web. In order to find the train times, I have to navigate through the esoteric organization of the Chicago Metra train website– and every time, I’m struck by how much useful information is just sitting there, waiting to be set free with semantic markup. 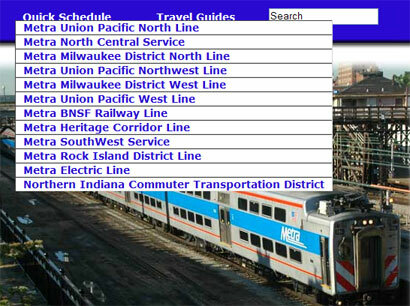 The Metra site itself is easy enough to use, if you’re already familiar with the train system in Chicago. However, it’s got to be quite a challenge for anyone who’s new to it. The problem is that the train schedules are organized according to train lines, rather than by what station you’re traveling to or from. For instance, when you click the “Quick Schedule” link, you just get a list of all the train lines in the system, with options like the “Metra Heritage Corridor Line” and “Metra BNSF Railway Line.” This works great if you know where these train lines run. Unfortunately, if all you know is that you want to get from Chicago to Elmhurst, well, you’ll need to dig around quite a bit to figure out the correct train line to take. This is where the Semantic Web could really help. When the data on the Metra site gets marked up semantically, the information it offers will no longer be tied to the way it is presented on the page or limited to being organized and consumed in only one way. So, if the train schedules are given a universal resource identifiers (URI) and other semantic markup, they would be available directly to the rest of the web and could be accessed and used independently from the way they’re organized in the Metra site. The data itself would be its own web-based resource. As a result, Metra could continue to list their schedules according to each train line, if they think this is best methodology, but other users and applications would have the ability to re-use this information and present it differently. For instance, a person might be able to type in “Chicago” and “Elmhurst” into a trip planner on an iPhone and have it look up the train schedule automatically. The web is mainly a set of connected documents right now. But, as the Semantic Web grows, an increasing number of data resources will have the ability to be connected to each other, with the potential for being re-mixed and re-purposed.